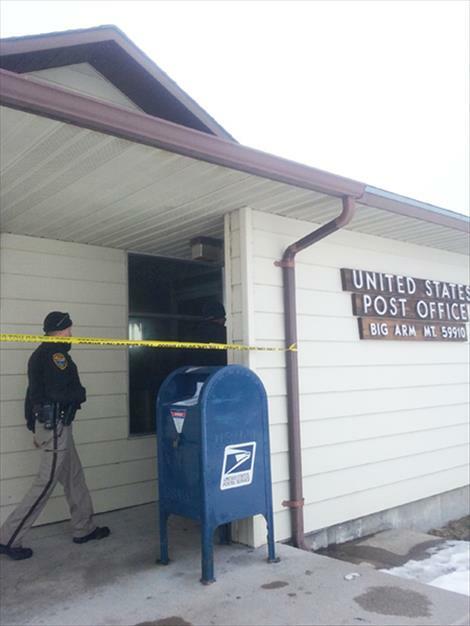 BIG ARM - A fire at the Big Arm Post Office at 11 p.m. Tuesday, Jan. 9 resulted in postal services being moved to the Elmo office. Polson Rural Fire Chief Gordon Gieser said 25 firefighters from Polson Rural, Polson City and Chief Cliff fire departments responded and had the fire contained within 30 minutes and extinguished in an hour. The cause is under investigation. Gieser said the damages are estimated at around $40,000 and that firefighters broke two side windows to ventilate the building. According to Hal Barber, USPS manager of operations for western Montana, there are no indications that any mail was lost.